Orange-carrot is little less sweet as compared to the desi carrot that is eaten raw or in juice. This is a cool season crop that can tolerate temperate climate. Late summer through fall is the best season for carrot cultivation. 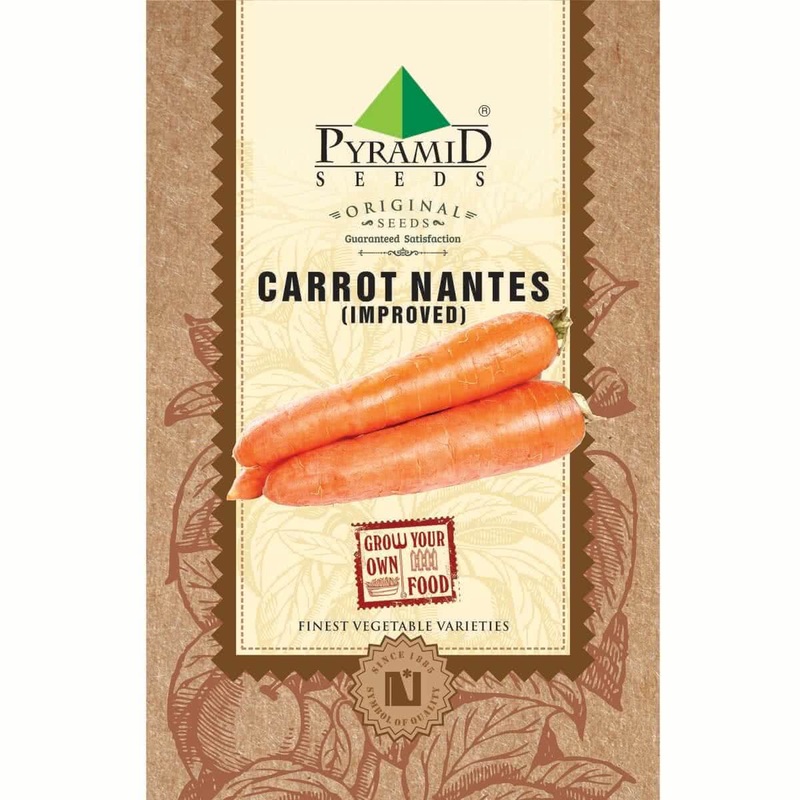 Introduction and Uses: Carrot is a humble vegetable that is loved by one and all. It is usually thought of an orange root vegetable, but its heirloom varieties including the purple, yellow and white color ones are equally attractive. Carrots are enjoyed both raw and cooked. The soft pectin fibre in carrot is known to cure skin irritations and an upset digestive system. Pectin is also known to lower high cholesterol. 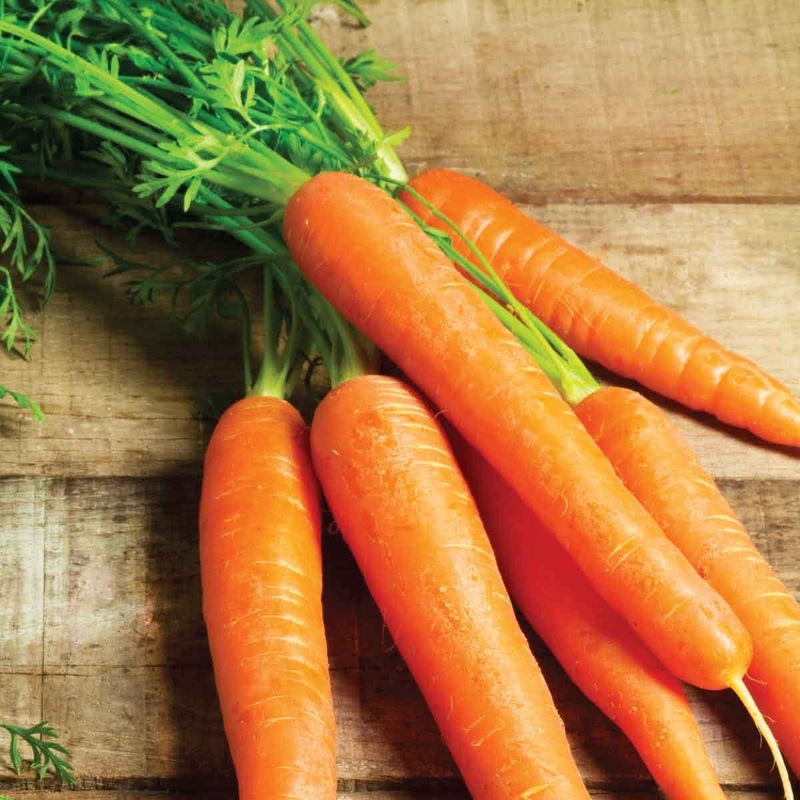 Beta-carotene gives carrot its dark orange color and might also protect you from various cardiovascular diseases by fighting the free radicals. The seed oil of this amazing veggie is known to moisturise the skin. Botanical Name: Daucus carota subsp. sativus 'Nantes'. Growing container: Choose a container with a minimum depth of 12-14 inches & bigger spread area (according to available space & your requirement) like the deep rectangular containers. Growing medium: 2 part Garden Soil & 1 part any organic manure or 1 part garden soil, 1 part coco-peat & 1 part Vermicompost. Spacing: Make shallow holes (1 cm) with a distance of 1 x 1 feet throughout the surface of soil medium. Sow 2-3 seeds per hole. Push the little seeds bit in soil medium with your fingers & completely cover them with surrounding soil. Germination: Seeds will germinate within first six days or even much earlier & tiny seedlings will be visible with first leaves. Baby seedlings will be visible in 10-15 days. Thinning: If more than one seed has germinated per hole, cut off the smaller seedlings & only keep one seedling per hole. Harvestable Carrots will gradually develop for next 2-3 months. Sunlight: Carrot plants require full sunlight (6-8 hours) in winter, so place your containers accordingly. Watering technique: Water your Carrot container / raised bed every day in the form of a light shower with watering can. Use sprinklers for watering the Carrot plants outdoors. Manuring: Add optimum quality organic manure with 2:1 ratio before sowing the seeds. Use organic manure like the well rotten cow dung manure, farmyard manure, Compost or Vermicompost. Tip: Avoid adding nitrogen fertilizers in the later stages of plant growth for better root formation. Plant care: Look for the early signs fungal infection/ insect infestation. Spray appropriate medicines as soon as any symptoms are visible. Microgreens: Grow micro greens carrot indoors in flat containers. Sow-scatter the seeds in a crowded manner. You can harvest it in 10-15 days by uprooting the baby plants. Harvesting: About 100-120 days after sowing, Carrots can be harvested by uprooting. You need to uproot them from the soil along with the whole plant. These carrots done great in our garden in late November during cold weather. Very easy to grow. All I had to do was water it !! !